The best and fastest product filter plugin for your WooCommerce store, with awesome features for both you and your customers. WooCommerce Product Filter is the ultimate all in one filter for any online store! With advanced filters for your customers and full control for you, this is a must-have product filter plugin for any WordPress and WooCommerce online store owner. WooCommerce Product Filter offers unlimited options, so that your customers can filter by any and all criteria and find exactly what they’re looking for! Setup is quick and easy, and you can use the super friendly admin user interface to fully customize how your filter looks and works – choose from unlimited layouts and display options, configure criteria and filter terms, and create filter presets. Advanced features, such as adoptive filtering and smart filter analytics, set WooCommerce Product Filter apart from the competition and help you take your store to the next level. So what are you waiting for? Easy plugin integration. Works with WooCommerce Shop and Product Archives. 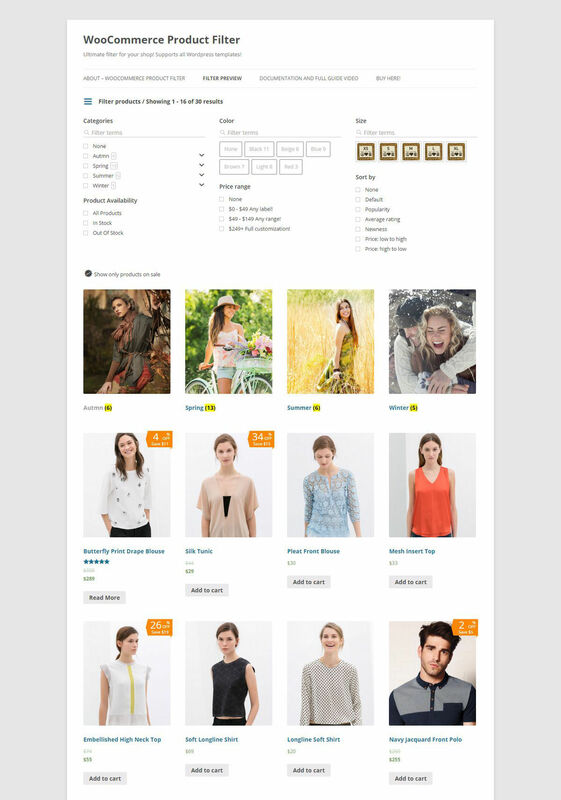 Fully integrated with WooCommerce shortcodes. Supports Visual Composer elements too! Gutenberg is supported too! Use WooCommerce Gutenberg Product Blocks with Product Filter! In Stock Support – The most comprehensive In Stock/Out of Stock variable product support. Filter by Any Criteria – Price filters, ordering, categories, attributes, taxonomy filters, in stock filters, sale filters, ratings, range, meta key filters and search filters are available. AJAX is supported too, for seamless filtering. Awesome Admin User Interface – Setup your filters in minutes using the Filter Presets Manager. 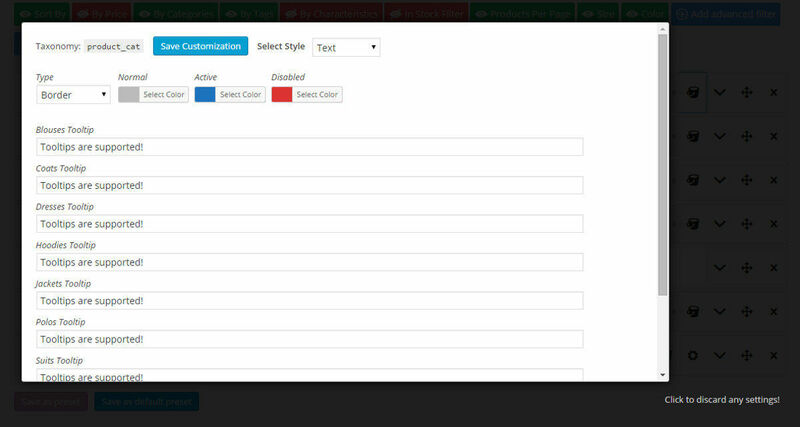 Full Customization – Customize filter terms, thumbnails, colors, checkbox layouts, select box, and more! Range Filters – Available for prices and taxonomies, including attributes. Use numerical ranges in your filters. Adoptive Filtering – Show only remaining terms within your filters, narrowing down the filtering criteria. 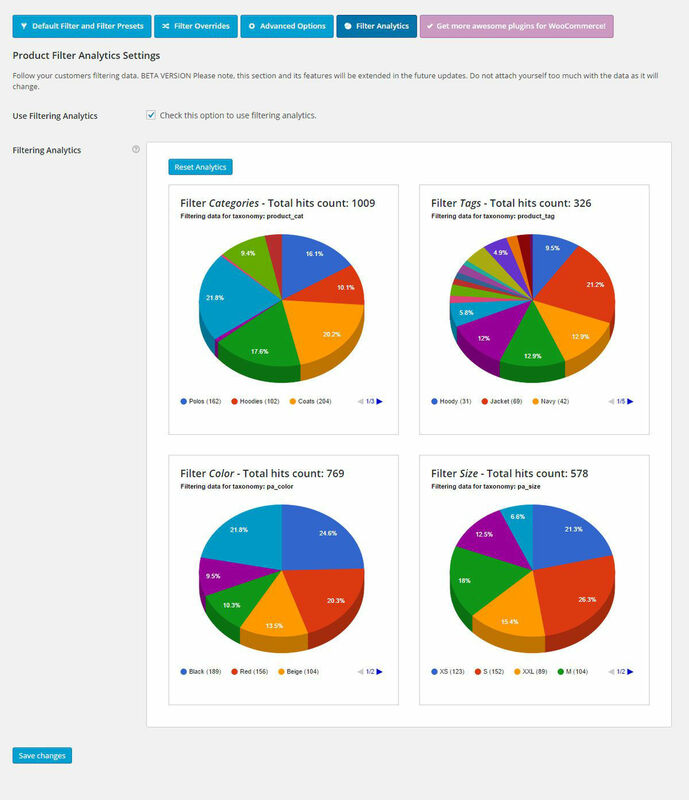 Filter Analytics – Get an insight into what your customers want! Sidebar and Widget WooCommerce Product Filters – Full support for all themes in sidebar mode. Automatic Updates – Get instant updates via Wordpress in a single click! Just enter your purchase code in the Product Filter Registration. Documentataion and video guide → Click here! Say goodbye to time-consuming searching and sorting! With this awesome plugin, your customers can filter your products by any criteria – Categories, Attributes, Characteristics, Tags, Prices, Stock and Taxonomies. Each filter criteria is configurable, giving you maximum control over what your customers are filtering and the results they see. Layout options include One Row, Multiple Row, Masonry, Filter Sidebars, and Fullscreen Filters. You can also create unlimited filter presets and use them with the Product Filter shortcode, or to override your Shop/Product Archives filters. WooCommerce Product Filter is seamlessly integrated with the WooCommerce interface, and the super friendly drag and drop Product Filter Manager gives you a whole new level of flexibility and usability. Choose from a selection of clean and contemporary style options, or combine multiple styles, to find the look and functionality that perfectly suits your online shop. Customization using CSS is a breeze, so you will be able to achieve outstanding results with very little coding skills and perfectly integrate the WooCommerce Product Filter into your web shop. This long-awaited feature is finally here! The WooCommerce Product Filter just got a whole lot more awesome… You can now customize each of your filters by using the Filter Style Customizer. Display filters as Text, Image, Thumbnail, Thumbnail with Text, Select Box or insert custom HTML. Enjoy unlimited layout possibilities, styles, colors and thumbnails, and make your product filter your own! With Term Customizer you can customize your term values, like filtering by price or setting products by page. Filter by Price, Stock, Taxonomies, Sale Filters, Custom Taxonomies, Attributes, Tags, Characteristics and more! Choose which terms to show, how they are ordered, hierarchy, with multi select ON or OFF and with filtering IN and AND, enable or disable adoptive filtering, select term relations, use images for presenting your variations (color, size, etc.) and much more! Adoptive filtering means that if you have active filters, remaining terms within your filters will take these into account. This makes for an even more premium browsing experience for your customers as they can narrow down their search criteria in no time! You can choose to hide the non-existing terms or show them in different styles. This places WooCommerce Product Filter head and shoulders above the competition. For more information on how to get the most out of adoptive filtering, see the WooCommerce Product Filter guide video. If you are using Product Filter in your web shop sidebar, Product Filter Widget is also included. 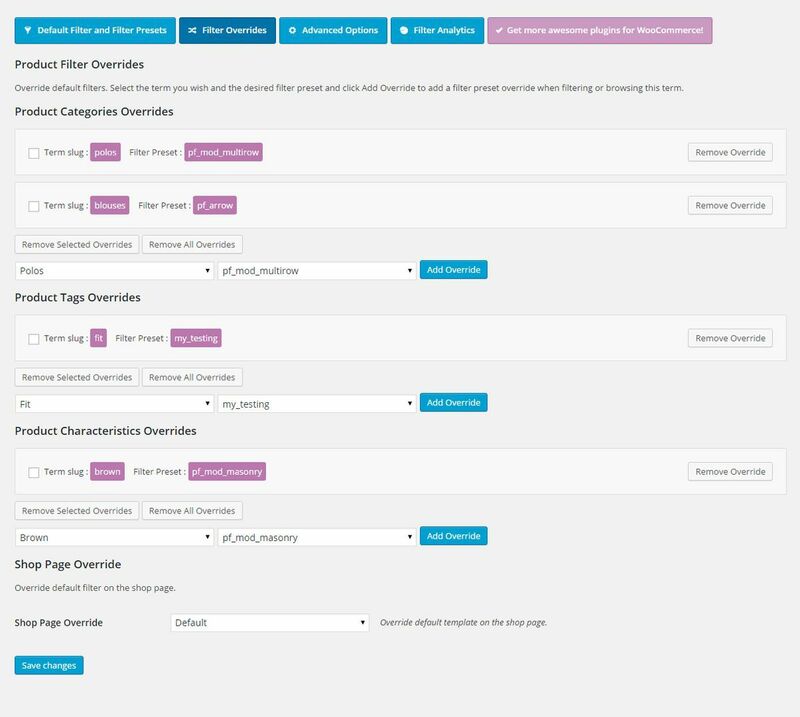 All filtering styles and range filters are also supported in the WooCommerce Product Filter Widget. Product Filter Widget supports loading a filter preset for the widget, AJAX, adding custom actions for redirecting the filter results to specific pages within your shop, as well as all the features of the original filter. Product Filter widgets will seamlessly integrate within your sidebar. If you don’t want the page to reload every time a filtering action is performed, you can also use the incredible AJAX load function, so that the filter results are displayed instantaneously, right before your customers’ eyes! AJAX loading is ultra fast in both shortcode, widget and using the Shop/Product Archives. Please note that AJAX is not supported in all themes. Consult the documentation for the plugin, or the plugin author, to confirm that AJAX will be available for your needs. Find out what your customers are looking for in your store! Detailed filtering analytics give you a complete overview of the popular filter terms with the WooCommerce Filter plugin – an invaluable tool for any shop manager and business. Improve your store experience and, ultimately, make more money! Find out at a glance, presented in fine graphics, what your customers want most so that you can tailor your goods and products to your customers’ preferences. Make your filters even more flexible with price, attribute or taxonomy ranges. WooCommerce Product Filter offers four different styles – White, Flat, Modern and HTML5. Range filters support ordering methods and special suffixes / prefixes which, combined, can be used for numerical ranges of all kinds! Check out the documentation to see how easy it is to set up and customize ranges. WooCommerce Product Filter works with your product variations and displays the featured images for current active filters. In Stock and Out of Stock for variable products is also supported, so your customers can choose to browse only In Stock, available products, to avoid disappointment. These filters can also be used with the product variations and their attributes: when filtering certain attributes, such as sizes or colors, some variations can be marked as Out of Stock. WooCommerce Product Filter has it all covered! Large or small, desktop or handheld, WooCommerce Product Filter is fully compatible and responsive! WooCommerce Product Filter dramatically improves the browsing experience on a tablet or a phone, making it easy and convenient for customers to enjoy their shopping experience and make purchases on all devices. Use Envato Market plugin to get automatic updates, with a single click, directly from WordPress. Any future update made available by the author is included with every purchase. Upon a new release, get notified directly from your Wordpress Dashboard. Update the plugin from the Dashboard Plugins with the automated Wordpress functions. Always use the latest version for the best compatibility! + Product Filter for WooCommerce 6.6.5 - 24. January 2019. + Product Filter for WooCommerce 6.6.4 - 20. November 2018. + Product Filter for WooCommerce 6.6.3 - 2. November 2018. + Product Filter for WooCommerce 6.6.2 - 25. October 2018. + Product Filter for WooCommerce 6.6.1 - 27. September 2018. + Product Filter for WooCommerce 6.6.0 - 10. August 2018. - fixed default category missing. if you want uncategorized category removed read this → How to remove Uncategorized from Shop and filters? + Product Filter for WooCommerce 6.5.8 - 24. May 2018. + Product Filter for WooCommerce 6.5.7 - 5. May 2018. - minor update, do not expect a lot of fixes! + Product Filter for WooCommerce 6.5.6 - 31. March 2018. + Product Filter for WooCommerce 6.5.5 - 18. March 2018. + Product Filter for WooCommerce 6.5.4 - 9. February 2018. + Product Filter for WooCommerce 6.5.3 - 8. January 2018. + Product Filter for WooCommerce 6.5.2 - 20. December 2017. + Product Filter for WooCommerce 6.5.1 - 12. December 2017. + Product Filter for WooCommerce 6.5.0 - 21. November 2017. - added infinite scroll! no more silly plugins, just use PF infinite scroll! - added new browser history system, now a lot better and smoother! + Product Filter for WooCommerce 6.4.5 - 3. October 2017. + Product Filter for WooCommerce 6.4.4 - 3. October 2017. + Product Filter for WooCommerce 6.4.3 - 28. September 2017. + Product Filter for WooCommerce 6.4.2 - 21. September 2017. - fixed taxonomy terms ordering! + Product Filter for WooCommerce 6.4.1 - 22. August 2017. + Product Filter for WooCommerce 6.4.0 - 17. August 2017. - improved completely re-worked product-filter.php template, optimized, now up to 100% faster! 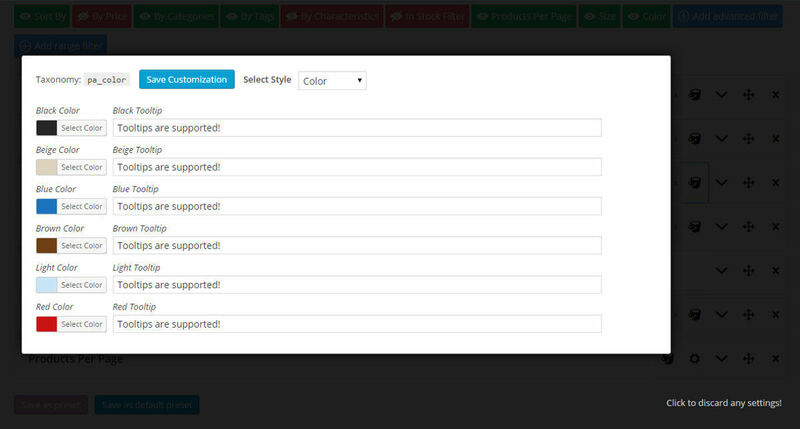 - added full support for WooCommerce shortcodes! integrate filters with ease! check more in documentation under shortcodes! - added Visual Composer WooCommerce shortcodes support! straight out of the box! seamlessly integrated! - fixed WPML related issues, language switcher not being able to save proper presets/default filter, currency switcher issues and similar. PF now supports WPML like never before! + Product Filter for WooCommerce 6.3.0 - 20. June 2017. 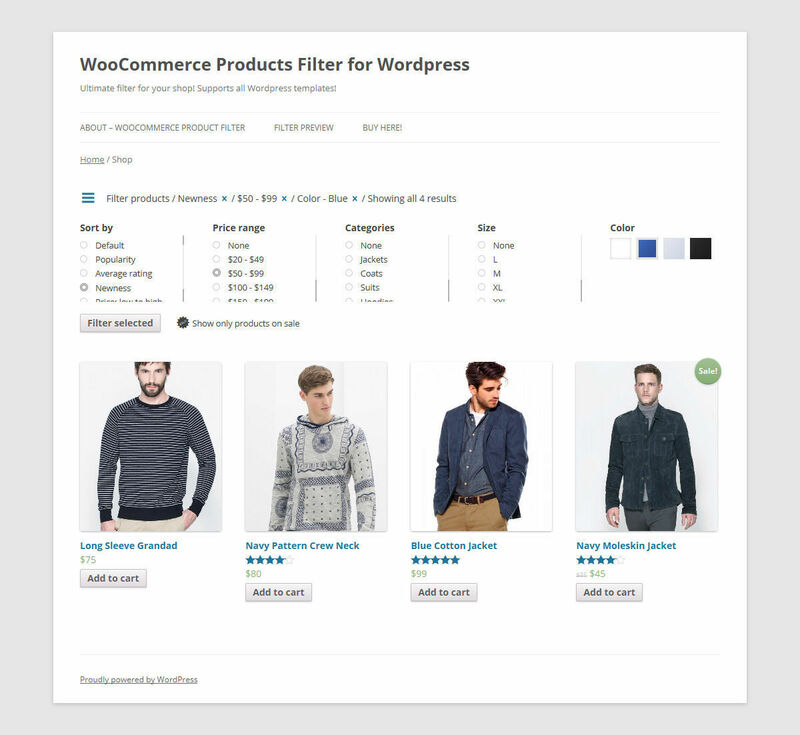 + Product Filter for WooCommerce 6.2.3 - 19. April 2017. + Product Filter for WooCommerce 6.2.1, 6.2.2 - 18. April 2017. + Product Filter for WooCommerce 6.2.0 - 17. April 2017. - added support for WooCommerce 3.0.0 instock/outofstock products, now instock filters are super fast on WooCommerce 3.0.0! + Product Filter for WooCommerce 6.1.1 - 17. February 2017. - fixed missing icons from admin panel <img src="/images/smileys/happy.png" alt=" :)" title=" :)" /> sorry! + Product Filter for WooCommerce 6.1.0 - 16. February 2017. + Product Filter for WooCommerce 6.0.8 - 13. February 2017. + Product Filter for WooCommerce 6.0.7 - 13. February 2017. - improved and reorganized plugin database options and auto-loading, performance boost across whole site, you'll surely notice that! + Product Filter for WooCommerce 6.0.6 - 13. February 2017. + Product Filter for WooCommerce 6.0.5 - 9. January 2016. + Product Filter for WooCommerce 6.0.4 - 8. January 2016. + WooCommerce Product Filter 6.0.3 - 6. January 2016. - added mobile/handheld filter presets! have two filtering presets, one for mobile/handheld and the other for laptops/desktops easily! - added custom settings for the range filters! min, max, prefix, postfix, step and grid_num! + WooCommerce Product Filter 6.0.2 - 6. December 2016. + WooCommerce Product Filter 6.0.1 - 25. November 2016. + WooCommerce Product Filter 6.0.0 - 22. November 2016. - added full support for instock/outofstock, out of stock threshold, better support for stock quantity, backorders are now out of stock and should be a lot faster! - added full support for customizations and hierarchy! hierarchy in colors, thumbnails and other customized filters! + WooCommerce Product Filter 5.9.3 - 25. October 2016. + WooCommerce Product Filter 5.9.2 - 17. October 2016. - added filtering instock/outofstock products by quantity! + WooCommerce Product Filter 5.9.1 - 14. October 2016. + WooCommerce Product Filter 5.9.0 - 13. October 2016. - added SMART hierarchy filters. now hierarchy is intuitive and fully supported. even with multi selection! + WooCommerce Product Filter 5.8.5 - 24. August 2016. + WooCommerce Product Filter 5.8.4 - 17. August 2016. + WooCommerce Product Filter 5.8.3 - 3. August 2016. + WooCommerce Product Filter 5.8.2 - 25. July 2016. + WooCommerce Product Filter 5.8.1 - 12. July 2016. + WooCommerce Product Filter 5.8.0 - 11. July 2016. + WooCommerce Product Filter 5.7.3 - 25. May 2016. + WooCommerce Product Filter 5.7.2 - 21. May 2016. + WooCommerce Product Filter 5.7.1 - 20. May 2016. - IMPORTANT - theme specific installations are updated, check your settings! - added translations! now fully translated in Spanish, French, German and Italian! + WooCommerce Product Filter 5.7.0 - 13. May 2016. + WooCommerce Product Filter 5.6.0 - 9. May 2016. + WooCommerce Product Filter 5.5.7 - 7. May 2016. + WooCommerce Product Filter 5.5.1 - 5.5.6 - 26. April - 4. May 2016. - fixed more issues with the 5.5.0 release, thanks for your patience! + WooCommerce Product Filter 5.5.0 - 24. April 2016. + WooCommerce Product Filter 5.4.0 - 22. March 2016. - improved search support on shortcodes/themes with search fileds and categories etc. - hopefully this is the last in the recent update series which should be a lot faster and a lot precise! thanks for your support and patience with the recent updates! - fixed currency switcher issues, now all currency switcher plugins will work perfectly, even the range filters! - added an awesome documentation with load of examples! please check the all new documentation in your full archive downloaded from codecanyon.net! - from now on we have the automatic updates!! when the new product filter is released you can update it hassle free directly from your Wordpress! - added Filter Analytics! Analyze what your customers are searching for in the brand new Product Filter Analytics! - fixed hierarchy filter issues, selected term etc.